Please join Mountains Restoration Trust and the Conrad N. Hilton Foundation on December 6 in Calabasas and December 13 in Malibu to explore our local and complex fire ecology of our local mountain range. 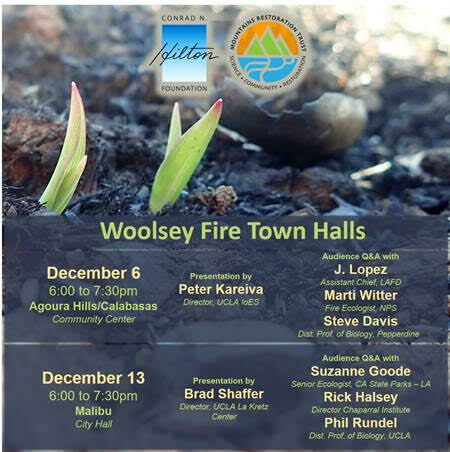 They have assembled experts to field your questions in a moderated town hall where all are welcome to come and ask questions about Fire Ecology in the Santa Monica Mountains. If interested, please RSVP via the links provided below. This entry was posted in Education, history, News, Upcoming Events. Bookmark the permalink.